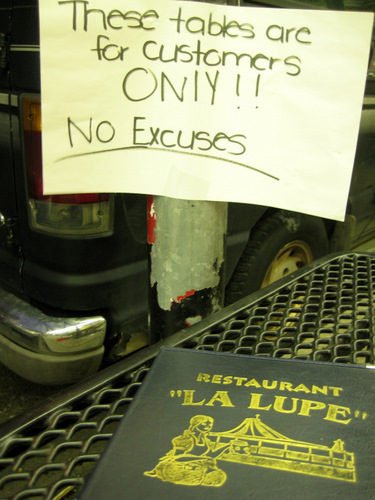 After playing with some hula hoops in south philly, M suggested we grab a bite at La Lupe. It’s totally next door to Geno’s. You can eat outside and laugh at the people waiting in line at Geno’s for crap cheesesteaks. We got one of the tables outside with this very fancy sign taped to the pole. This is a high class joint! I kid, I kid. It’s very low key. They use mexican blankets as tablecloths on the inside. It has no ambiance at all. But that’s fine by me, as it’s all about the food here. I hadn’t even ordered a jarritos, but for whatever reason, the little italian guy, yes, I said italian, just came over and brought me one. I told him I hadn’t ordered it yet, and he said that’s ok! It’s like he read my mind! And we also found out it was taco tuesday! $1.50 tacos! It was sheer coincidence, but it made me very happy right away. 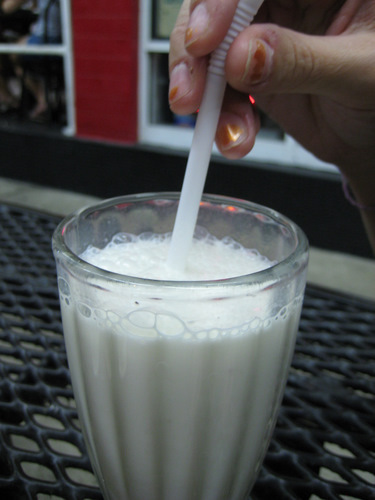 M got a shake. I believe it was banana? It was fresh and tasty! 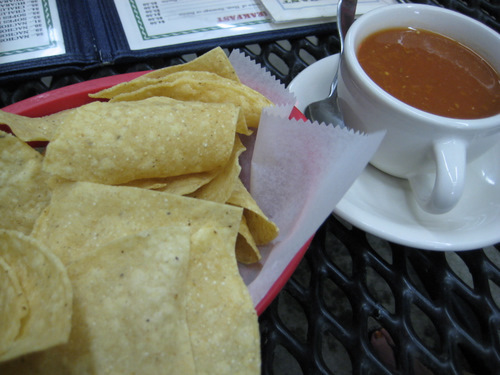 Your complimentary chips and salsa. The chips were super crispy and non-greasy, just the way I like it. The salsa was just ok. It was a bit on the bland side and really runny. 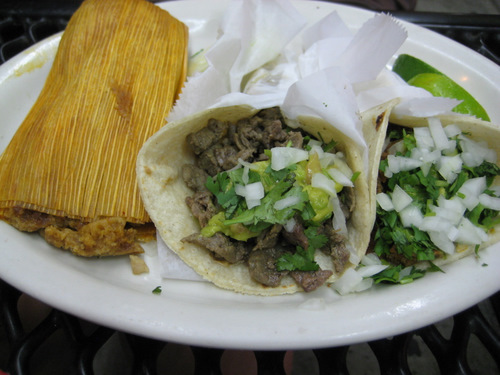 P’s two tacos and tamale. She enjoyed both, and man, look at the size of that tamale! 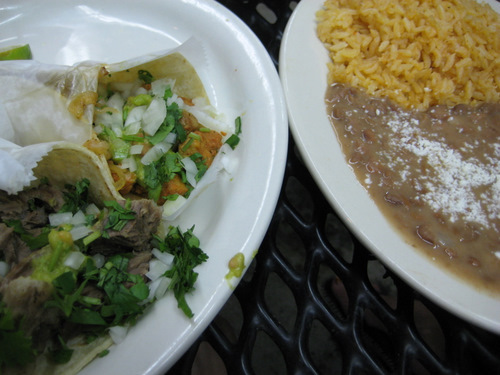 I got a barbacoa and an al pastor taco, as well as my requisite rice and beans. They serve real tacos here, with corn tortillas and just cilantro and raw onions as the toppings, really, the way they should be. The barbacoa, stewed goat, was unbelievably good! It was a bit on the fatty side, but I liked it, as it made it super tender and juicy. And the al pastor was good as well, but the pineapple was from a can. But it was grilled and I liked it anyway. Rice and beans were also good. The service isn’t that great. I mean, the italian dude is super nice and friendly, and he means well, but it is kind of hard to get water refilled here and you have to ask for silverware. And the food does not exactly come out fast. 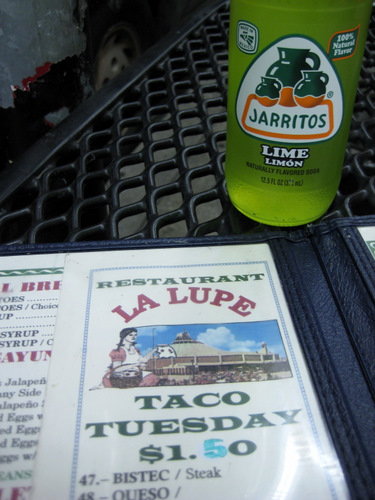 But when you’re just hanging outside on a nice evening, waiting for $1.50 tacos isn’t a terrible thing. I think it’s worth it! updatеd οn а regulаr baѕіs. It conѕіstѕ of nice data. Good publish. I am a regular guest of your web page and appreciate you trying to sustain the awesome web page. I’ll be a regular guest for a really period of your energy and energy. 5 is written in marker on the menu – that is awesome!